The review embargo for Remedy’s time-hopping game/TV show Quantum Break lifted last night and it’s...well, it’s possibly the new frontrunner for “Most Polarizing Game of 2016,” judging by the scores. But some people really like it, which means you might really like it, which means maybe you’re thinking of preordering it. My recommendation: Don’t. This isn’t a review. Just a warning. I’ve played some of the PC version at a preview event, and it seemed to run fine, but Microsoft has yet to distribute PC code for review, which means every review you’ll see today was played on an Xbox. Usually I wouldn’t write an entire article based around this fact. PC code often is the last to go out, comes in hottest, and takes most advantage of Day One patch malarkey—to say nothing of drivers. But this is Quantum Break, and in case you forgot: Quantum Break is only being sold through the Windows Store, as a Windows 10 exclusive. Not only are there a number of problems with the way the Windows Store currently handles games, but Gears of War: Ultimate Edition’s PC launch in March was an unholy mess—we’re talking DirectX 12 issues, download issues, a stunning lack of graphics options, the works. Just the worst kind of port. 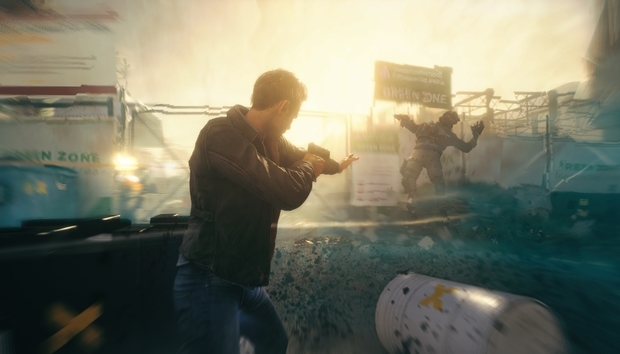 And in light of that, I have to strongly recommend you hold off purchasing Quantum Break for your PC until you know whether it will run well or not. To that end, we’ll be checking out the port quality literally as soon as it’s made available to us and will update you when we can. Make Microsoft earn your trust, though. If they’re going to go the way of a closed storefront, first they need to prove it adds any sort of value—or even works at all.